Left to Right:*Shinsoo's Light, Shinsoo's Descent, Fairy Tale Ballad, Shinsoo's Steps (M), Imperial Honor;*Empress's Light, Googly Face Accessory, Audience with the Empress (F), Empress's Steps (F), Fairy in a Gilded Cage;*Lucid Fedora, Sweet Shipmate Uniform (F), Sweet Shipmate Boaters (F), Dreamland Thief Effect Ring;*Cloud Crown, Round Pucker Face, Sweet Shipmate Uniform (M), Sweet Shipmate Boaters (M). Left to Right:*Pink Bear Winter Hoodie, Pink Bear Winter Padded Coat, Pink Bear Winter Boots, Snowy Cherry Blossom Label Ring, Frosty Cherry Blossom Chat Ring;*Nova Enchanter Hat, Nova Enchanter Clothes, Nova Enchanter Winged Cape, Nova Enchanter Staff;*Tennis Cap, Tennis Uniform (Male), Tennis Racket;*Seafoam Ribbon, Seafoam Coral Coordinates (M), Bitten Donut Ring. 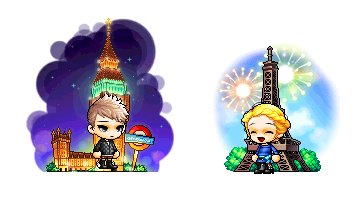 Update your character's look with a Royal Hair Coupon or Royal Face Coupon! Check out the Male Hairstyles available now: Sweet Stuff Hair (NEW! ), Marbel Hair (NEW! ), Singe Hair, Dylan Hair, Wavy Mop, Emo Boy Mid-cut Hair. Check out the Female Hairstyles available now: Sweetie Pie Hair (NEW! ), Forest Wind Hair*(NEW! ), Irena Hair, Aerial Hair, Chic Tail Hair, Sylph Hair. Check out the Male Face Styles available now: Curiosity Face (NEW! ), Docile Face, Alluring Face, Doe-Eyed Face, Adam Face, Futuristic Face. Check out the Female Face Styles available now: Curiosity Face (NEW! ), Docile Face, Alluring Face, Doe-Eyed Face, Eve Face, Futuristic Face. You can see the all the rewards rates for Royal Style Coupons*here. Take home a little version of Lucid! Choose from Ebony Lucid, Powder Lucid, and Rose Lucid. Summon these pets to obtain the Just Chillin' skill, which will increase your Weapon Attack and Magic Attack. The skill will grow stronger as you equip more Lil’ Lucid pets. The individual Lil’ Lucid pet packages come with an equip to wear, yummy pet food to eat, a Pet Name Tag, and some useful pet skills and scrolls. Bring these powerful*Lil' Lucid pets along for*your journeys in Reboot World! Give your new Lil' Lucid pets*a little sparkle with this permanent pet equip! Step into a World of Pink*with these colorful permanent outfit pacakges! Choco Digestive Aid: Drink this to have a 50\% chance of preventing Choco Frenzy from being triggered by a Choco Syringe. Can be used one time. Choco Insurance: After entering a Choco Frenzy, this item allows you to restore 80\% of your lost Choco Power. The buff triggers once and vanishes at midnight UTC. Choco-Neutralizer Implant: This item allows you to consume up to 80 Sweetheart Choco using the Choco Syringe without triggering Choco Frenzy. Chocolate Rain Atmospheric Effect: Use this to grant Choco Power +30 and Weapon ATT/Magic ATT + 20 to everyone in the map for 15 minutes. It may trigger a Choco Frenzy. Matryoshka Choco Gachapon: Use this item to gain Choco Power +10 without the risk of triggering a Choco Frenzy. You may receive an extra Matryoshka Choco Gachapon item when you use it (up to 5 total). Bitter Chocolate: Eat this to immediately trigger Choco Frenzy regardless of your current Choco Power level. This weekend, we will be having a special deal on Fusion Anvils and Medal Fusion Anvils! The Fusion Anvil allows you to take the stats and bonuses from one item (same gender) and combine them with the appearance of another. The functional item will determine which effects are kept. The Medal Fusion Anvil enables appearance alterations when it fuses Medal items. The effect is decided by the stat item. You have until 11:59 AM PST on February 17 (2:59 AM EST / 8:59 AM CET / 6:59 PM AEDT on February 18) to purchase these items. Make sure to move them from your cash inventory to your item inventory and use them soon! This weekend, we will be having a special deal on*4-Hour 2x Coupons and*1-Day 2x Coupons! Get twice the amount of EXP and drops for 4 hours or one whole day! NOTE:*As of the Jan. 23, 2019 update,*4-hour and 1-day 2x EXP Coupons can only be used at Lv. 249 and under. Each Valentine Surprise Style Box holds a random permanent equip with a Valentine’s Day theme! There are 100 different permanent items available! In non-Reboot worlds, you can trade these style box items with other players through the Cash Item Trade window, if you haven’t equipped them. Right-click on a character to see the menu. Check out some of the amazing items you can get from the Valentine Surprise Style Box! Left to Right:*Lovely Plaid Cap, Lovely Plaid (F), Lovely Plaid Shoes, Sweet Beary Chocolate;*Lovely Plaid (M), Round Glasses, Heart Diary;*Sweet Chocolate Cake Hat, Sweet Chocolate Dessert Suit, Sweet Chocolate Dessert Shoes, Chocolate Overload Face Accessory;*Red Ribbon Hairband, Warm-hearted Earrings, Refreshing Female Cardigan Outfit, Pink Candy Label Ring, Pink Candy Quote Ring. Left to Right:*White Choco Bunny, Choco Candy Cookie, Soft Chocolate Fondue Scepter, Splash Choco Boy (M), Chocolate Ribbon;*Blue Ribbon Hairband, Dollish Pink, Cold-hearted Earrings, Splash Choco Girl (F);*Blush, Red Rose Chat Ring, Red Rose Label Ring, Pink Tie Casual Suit (M), Black Suit Pants (M), Love Gloves;*Pink Mini Hat, Red T-Shirt w/ Heart, Pink Aviator Sunglasses, Chocolate Dipped Stick, Baby Pink Heart. Left to Right:*Lace Ribbon (Pink), Heart Face Painting, Strawberry Milk Dress (F), Balloon Bouquet;*Harmony Wings, Maid Dress (Blue);*Bloody Guardian Hood (M), Mint Chocolatier Stick, Bloody Guardian (M), Bloody Sneakers (M);*Giant Floppy Heart Hat, Hearty Flush, Chocolate Quote Ring, Red Check Rider. You can see all the rewards rates for Valentine Surprise Style Boxes*here. Get a special new look for Valentine’s Day! Take your Valentine's Royal Hair Coupon to NPC Big Headward in Henesys Hair Salon, or your Valentine's Royal Face Coupon to NPC Nurse Pretty in Henesys Plastic Surgery to get your new style! You can preview the styles by double-clicking on the coupon in the Cash Shop. Check out the Male Hairstyles available now: Nightlife Hair (NEW! ), Shy Bob, Daylight Hair, Prince Cut Hair, Bed Head Hair, Valentine Hair, Victory Rider Hair, Bestie Boy Hair, and Foggy Moonlit Hair. Check out the Female Hairstyles available now: Marilyn Hair (NEW! ), Cute Honey Hair, Angelic Buster Hair, Long with Bangs, Dip Dyed Hair, Eternal Wind Hair, Passion Fringe Pigtails, Luscious Locks, and Foggy Snowlit Hair. Check out the Male Face Styles available now: Intergalactic Face (NEW! ), Grudge Face, Louie Face, Patissier Face, Lonesome Face, Moonlight Eyes, Heartbroken Face, Sweet Face, and Puppy Eyes Face. Check out the Female Face Styles available now: Mysterious Concept (NEW! ), Blushed Face, Rosalia Face, Patissiere Face, Soulful Face, Louie Face, Heartbroken Face, Sweet Face, and Smooth Face. 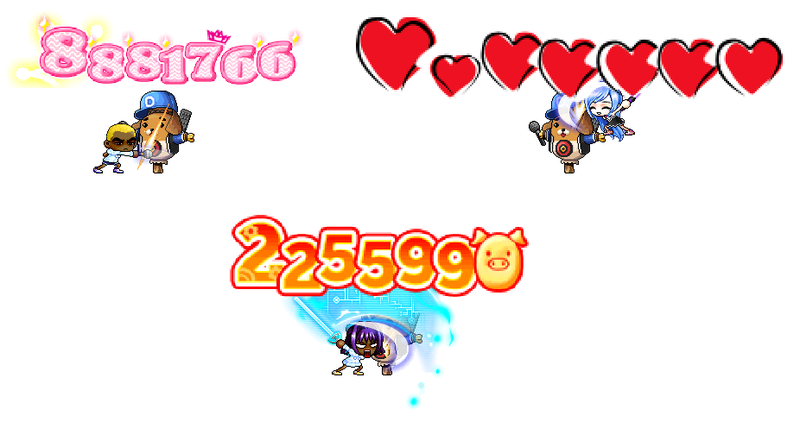 You can see all the rewards rates for Valentine's Royal Style Coupons*here. This cute little*Pink Yeti pet*will make for a ferocious companion on your journeys in Maple World! The pet package comes with an equip to wear, pet food to eat, a Pet Name Tag, and some useful pet skills and scrolls. This cute little*Pink Yeti pet*will make for a ferocious companion on your journeys in Reboot World! Give your new Pink Yeti a little blue friend with this permanent Pink Yeti's Blue BFF! Share your love with the world! Your message will be heard by everyone in the world and hearts are displayed. Available at a discount this Valentine’s Day! Celebrate your anniversary with the Commitment of Love Ticket! Every 100 days up to 1,000 days total, you and your partner can commemorate your marriage with new quests and get marriage-exclusive rings! After each 100-day milestone, the ring gets upgraded. Pick up these romantic weather effects that are just right for the season! Sprinkled Chocolate displays graphics on the map where your character is for 30 seconds. Petite Rose and Heart-shaped Chocolate Box give Weapon ATT/Magic ATT +30 to everyone in the map for 15 minutes. You can enter a message of your choice. Grab one of these permanent facial expressions to show your special someone how you feel about them! Assign to a hotkey to watch your character display their feelings to the world. Celebrate the most romantic time of year with these special Valentine's Effects! Put together a fun Valentine’s Day outfit with these permanent items! This includes a number of couples items which will display a special animation when you and another player wear it next to each other at the same time! Who’s the messenger of love? Bring love wherever you go with these packages of permanent items!